Clarins Instant eye make-up remover (£17) Here! & L’oreal Absolute make-up remover (£4.99) Here! Removing eye make-up is by far my least favourite bit of skincare. It’s boring, and I often find it hard to find a remover that takes everything easily off without stinging my eyes or leaving an oily film on my eyes. 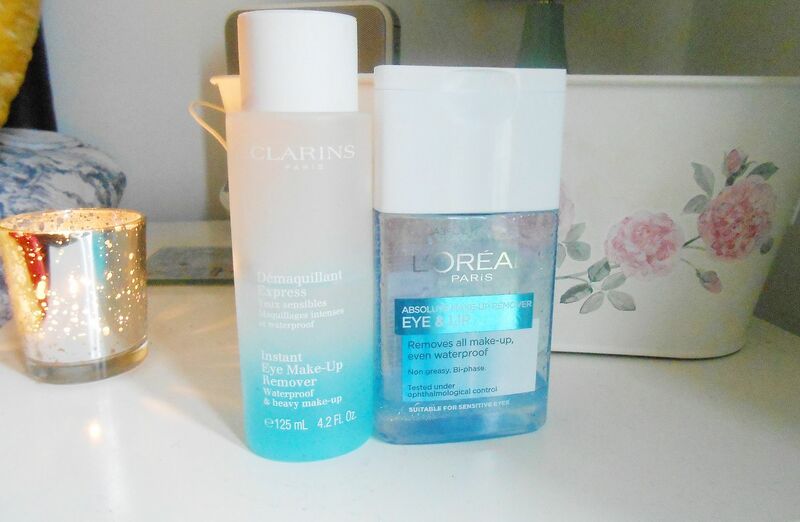 I picked up the Clarins Instant eye make-up remover earlier this year, and I was really impressed. It’s a dual-phase one, so you have to shake it before you (make) use it. It does work really well, and gets everything easily off. The oily formula is pretty greasy, and does leave a bit of residue on my lashes. It is pretty expensive, so I am a bit hesitant to pour it everywhere, and so I hold it on my eyes for a bit longer. The L’oreal Absolute make-up remover is… pretty much the same. You get exactly the same amount of product, it works in the same way, does the same thing but it is under a third of the price. It also doesn’t seem to leave as much film on the eyelashes, which can only be a good thing. I’m also not as cautious with this one, and so maybe I am liberal in my useage, which means it seems even easier? I just hold it on my lids for 20 seconds and gently wipe it and it takes off everything. How do you take off your eye make-up?